What makes Reds’ Cueto so hard to hit … and favorite for NL Cy Young? Through Thursday, Johnny Cueto leads the majors in ERA (1.25), WHIP (0.71) and strikeouts (76). Before the year started, an easy prediction for National League Cy Young Award winner would’ve been the Dodgers’ Clayton Kershaw. Then Kershaw, last year’s winner, went and got himself hurt, and though he’s presently back in action, the voters have historically been big on full seasons. When Kershaw went down, an easy substitute NL Cy Young prediction would’ve been the Marlins’ Jose Fernandez. Then last year’s NL Rookie of the Year who, finished third in the Cy voting, got hurt and is having Tommy John surgery on Friday. Philadelphia’s Cliff Lee, certainly, is a contender, if he doesn’t get traded to the other league. Washington’s Stephen Strasburg now has his ERA under control, and of course there’s no forgetting St. Louis’ Adam Wainwright, last year’s runner-up in the Cy voting. If the voting were to be conducted today, the certain winner would be Cincinnati’s Johnny Cueto … even if Kershaw and Fernandez hadn’t suffered their injuries, because Cueto has been that dominant. Thursday afternoon, Cueto spun his third complete game of the season — in a 5-0 win over San Diego — and dropped his majors-best ERA to 1.25 over 72 frames in nine starts. The 28-year-old right-hander has yielded just 10 runs in nine games. 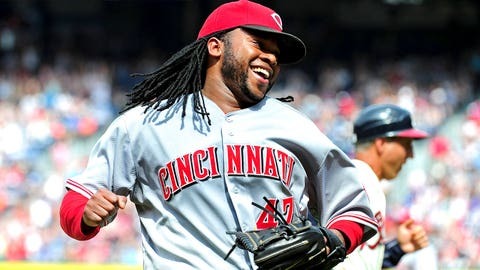 Ask Cueto and he’ll say he thinks he’s the best. Ask his teammates and they’ll say he deserves more attention. On MLB Network on Thursday, former major-league pitcher Al Leiter talked about how he feels like Cueto is just missing something that would make the Reds ace truly elite. But at some point the numbers speak for themselves, and if Cueto isn’t to be considered elite yet, he’s doing what he has to do to get there. Cueto’s been outstanding before. In 2012, he finished fourth in Cy Young voting. Then he wound up missing time last season because of injuries, but now not only is he pitching well — he might be pitching better than ever. He’s certainly made some conspicuous changes. This table will hint at something major. Look at Cueto’s strikeouts during his career. So far this season, Cueto’s strikeouts are up considerably. He used to strike out about two of every 10 batters. Now he’s closer to three out of 10. Cueto’s swinging strikeouts are basically unchanged. It isn’t that he’s missing a lot more bats. It’s that bats have only sometimes been in position to miss. Plus, Cueto’s called strikeouts are way, way up. This season, he’s more than tripled his rate, and at present Cueto is the major-league leader in called third strikes. He’s long been a good pitcher, but this is a brand-new twist. The pattern shows up against both right-handed hitters and left-handed hitters. Cueto already has struck out 21 righties looking. His previous season-high was 17 in 2008. Meanwhile, he’s frozen a dozen lefties — his season high is 21 and it’s only mid-May. Cueto is obviously doing something to leave these batters sufficiently helpless as they don’t even take the bats off their shoulders. This has mostly to do with Cueto’s sinker and cutter. Cueto’s a guy with a diverse assortment of pitches and speeds. It’s not that he’s been throwing a new pitch in 2014. It’s that he’s been throwing old pitches differently, in different places and in different frequencies. The changeup is still there — it’s still good, and it’s still a swing-and-miss weapon. But, sinkers and cutters used to account for about a fifth of Cueto’s strikeouts. This season, they’re more than half. He’s changed his two-strike approach to righties and lefties. Seen less often is Cueto’s slider. Previously, he liked to throw it low and away to righties, and low and in to lefties. These are common techniques, but in 2014 Cueto hasn’t tried to get many righties to chase, and lefties haven’t really seen that slider at all. Hal McCoy reported on Reds manager and Cueto’s former pitching coach Bryan Price talking about the ace avoiding those "empty pitches," pitches too far off to do any good. So it’s not a coincidence that we’ve seen less of Cueto’s hard breaking ball in two-strike situations. Cueto worked to keep himself closer to the zone; let’s individually highlight four similar two-strike adjustments. Data comes from Brooks Baseball. Between 2011-13 in two-strike counts, Cueto threw 5 percent cutters to righties. This year, it’s up to 20 percent. Before, he threw just 10 percent cutters over the inner third, or more inside. This year, it’s up to 56 percent. Cueto has pounded the cutter in, with hitters expecting the pitch to tail away from the plate. The cutter movement keeps it close to the edge. Cueto hasn’t meaningfully changed his two-strike sinker frequency to righties. 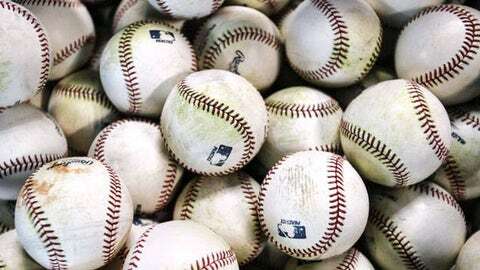 But over the previous three seasons, he threw 6 percent sinkers over the outer third, or more outside. This year, it’s 34 percent as Cueto has made something of a habit trying for the back-door run. He’s less often trying to jam the hitters inside. Cueto, with two strikes, has increased his cutter usage against lefties. More importantly, though, he’s changed how he’s used the pitch. Over the previous three seasons, he threw 42 percent of cutters over the outer third, or more outside. This year, it’s at 80 percent, as Cueto has tried to trick batters into expecting the pitch to run away. It’s a similar principle as the cutter approach against righties, except operating on the opposite side of the zone. Cueto has increased his throwing two-strike sinkers to lefties from 15 percent to 38 percent, while he’s gone from throwing 25 percent sinkers inside to 59 percent. The idea is the front-door sinker, getting lefties to back off, thinking the pitch is coming at them. Then the run carries the pitch back toward the zone. Well executed, it’s a pitch that’s impossible to do anything with, and Cueto’s been executing it well for a month and a half. I recently wrote on Toronto’s Mark Buehrle changing his approach against righties, allowing him to generate more called strikeouts. What Buehrle’s doing is similar to what Cueto’s doing, with one big difference: The third strikes are keeping Buehrle reasonably effective. For Cueto, though, the third strikes are launching him into the class of the majors’ elite, making him the NL Cy Young favorite. It’s going to be on the hitters to adjust to Cueto’s adjustments, and it’s not like Cueto can keep this a secret. Hitters will have a better idea of what Cueto’s trying to do with two strikes. But, ultimately, Cueto has a lot of pitches and a good idea of where they’re going, so hitters can adjust only so much. The key point is that pitchers can’t be hit if they do it right. It didn’t matter that every opposing batter knew what Mariano Rivera was doing. Johnny Cueto isn’t Mariano Rivera — or Bob Gibson, Sandy Koufax or Denny McLain, for that matter. But if Cueto maintains his mastery of location, movement and health, the Cincinnati right-hander can deliver one of the best seasons, and possibly stretches, by a pitcher in the long history of the game.